CHESTNUT HILL, Mass. – Boston College head football coach Steve Addazio has announced the hiring of Mike Bajakian (pronounced buh-JAKE-ee-an) as offensive coordinator and quarterbacks coach. 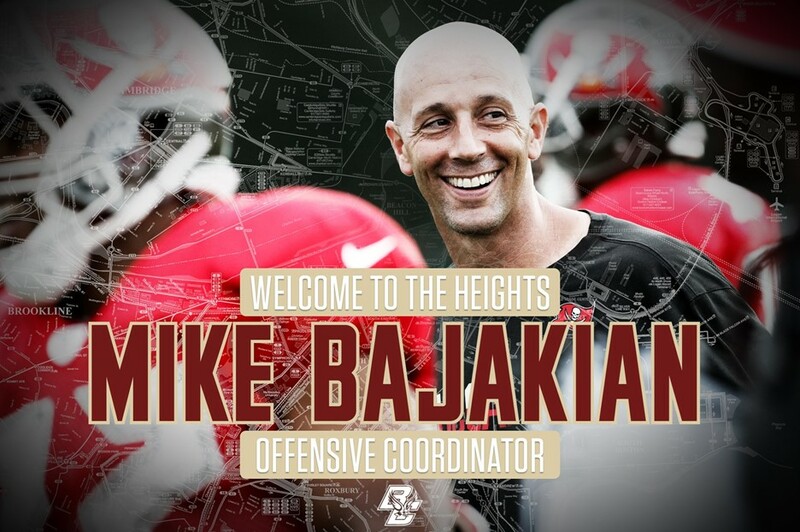 Bajakian comes to the Heights after serving the past four seasons as quarterbacks coach for the Tampa Bay Buccaneers. The Buccaneers led the NFL with 320.3 passing yards per game in 2018 and finished with the league’s No. 3 total offense (415.5 yards per game). Tampa’s quarterbacks ended the season with 5,125 passing yards, 36 touchdown passes, and a 65.3% completion percentage. The Buccaneers finished with 71 passing plays of 20+ yards and 14 passing plays of 40 yards or more. The 2017 season saw third-year Buccaneers quarterback Jameis Winston post career bests in completion percentage (63.8 pct. ), yards per attempt (7.9) and passer rating (92.2) while posting a career-low interception rate (2.5 pct.). Winston’s 7.93 yards per attempt set a single-season franchise record and his six 300-yard passing games were the most in a single season in team history. He also ranked in the top five in franchise history in single-season passer rating. Winston averaged 269.5 passing yards per game, which was the sixth-highest mark in the NFL. He also ranked fourth in both yards per attempt and yards per completion (12.43). Winston finished his third season with the third-most passing yards by a player from their rookie season through their third season, trailing only Andrew Luck and Peyton Manning, while registering the seventh-most passing touchdowns. In 2016, as a second-year quarterback Winston set single-season franchise records for passing yards (4,090) and passing touchdowns (28). Winston became the youngest player to throw for 50 touchdowns in NFL history and the first player in league history to throw for at least 4,000 yards in each of his first two seasons. In his first season with the Buccaneers, Bajakian coached rookie quarterback Jameis Winston, who helped guide Tampa Bay’s offense to a top-five finish in the NFL and the most yards in team history. Winston finished the season completing 312-of-535 passes (58.3 pct.) for 4,042 yards, with 22 passing touchdowns and six rushing touchdowns. Winston set team rookie records for passing yards, passing touchdowns, pass attempts, pass completions and passer rating (84.2). His 4,042 passing yards were then the second-most in a single season in team history and the third-most by a rookie in NFL history. Winston’s 22 passing touchdowns were then tied for the fourth-most in a single season in team history and the fourth-most by a rookie in NFL history. His six rushing touchdowns and 28 combined touchdowns were then the most in a single season by a Buccaneers quarterback, while his 28 total touchdowns were tied for the third-most by a rookie in NFL history. Bajakian joined the Buccaneers from the University of Tennessee, where he spent the previous two seasons (2013-14) as the team’s offensive coordinator. Bajakian was part of the coaching staff that helped the 2014 Volunteers earn the school’s first bowl game appearance since 2010 and first bowl victory since 2007, winning the 2015 Taxslayer Bowl. Tennessee went 4-1 in the final five games of the season, behind sophomore quarterback and future NFL quarterback Joshua Dobbs, who set a Tennessee single-game record for rushing yards by a quarterback in a win over South Carolina. In that same game, the team tied a school record with 35 first downs, en route to racking up 645 yards of offense, its most against an SEC opponent since 1997. During the team’s 4-1 stretch to end the season, it averaged 37 points per game, including three games of at least 45 points. In his first season with Tennessee, the team rushed for 2,261 yards, its most since 2004. Prior to joining the Volunteers, Bajakian worked as the offensive coordinator and quarterbacks coach for the University of Cincinnati (2010-12). While with the Bearcats, quarterback Zach Collaros became only the second passer in school history to throw for 6,000 yards (6,278) and 50 touchdowns (51). Cincinnati won conference titles in each of the final two seasons that Bajakian coached there, with the 2012 team leading the Big East in scoring offense, rushing offense and yards per play. The 2011 team also led the Big East in rushing, producing the Conference Offensive Player of the Year in running back Isaiah Pead. The 2010 squad led the Big East in scoring offense, total offense, and passing offense. From 2007-09, Bajakian worked as the offensive coordinator and quarterbacks coach for Central Michigan, where he had previously worked as the quarterback’s coach (2002-03). In his three seasons as the Chippewas’ offensive coordinator, the team posted its three highest-scoring offenses since joining the MAC in 1975 and his offenses set or broke more than 30 school records. Led by quarterback Dan LeFevour, who ended his career with 150 touchdowns – then an NCAA FBS-record – and Antonio Brown, who set season and career marks for total receptions and 1,000-yard seasons, the Chippewas won conference championships in 2007 and 2009. LeFevour, a two-time MAC Offensive Player of the year, finished his career with 15,853 yards of total offense, then the NCAA’s second-highest career total. Bajakian has previously worked in the NFL, working with the wide receivers as the Chicago Bears offensive quality control coach for three seasons (2004-06). He was a member of the 2006 Bears team that won the NFC Championship and played in Super Bowl XLI. A native of River Vale, New Jersey, Bajakian was an All-New England Small College Athletic Conference and All-ECAC quarterback at Williams College.